During the last year there has been a string of revolutions and uprising that have taken place throughout the Middle East referred to as the Arab Spring. 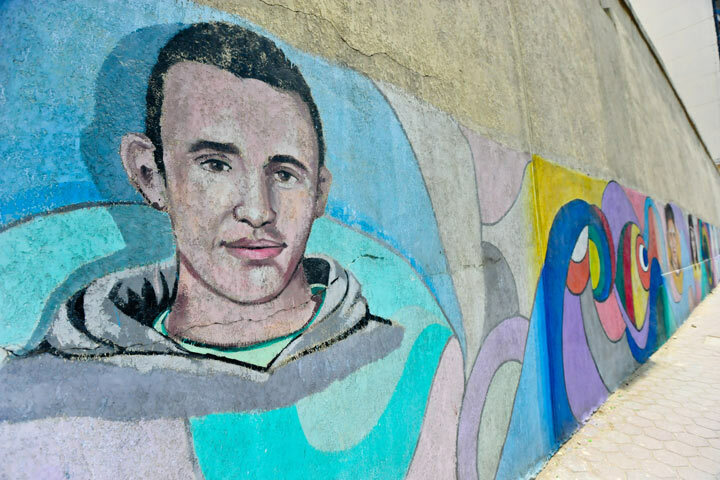 The fall of certain oppressive regimes (specifically Tunisia, Egypt and Libya) has birthed an explosion of graffiti art in places where there was none before. These uprisings led by the people are also sparking a new wave m iddle eastern art made for the people, by the people. Much of the street art in Libya still focuses on images of ousted ruler Muammar Gaddafi. 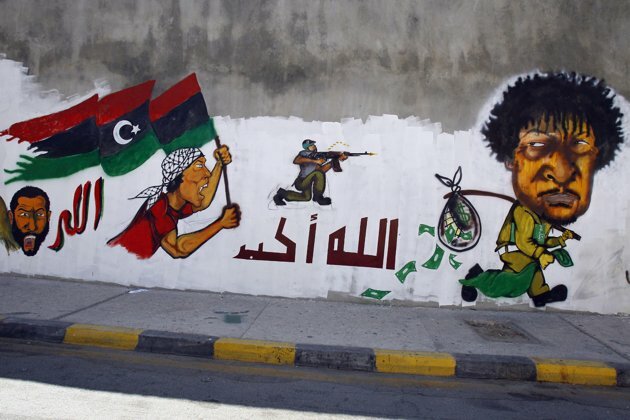 The image above, painted onto a wall in Tripoli depicts Gaddafi fleeing from Libyan rebels with a sack of money. The rebels themselves appear menacing in the image driven mad by their fight for freedom (possibly a look at the costs of revolution). In the center it reads "Allah Akbar" which means "God is Great". I find it interesting that even in this violent image of war the unknown artist still pays a tribute to God. I believe this speaks culturally to the role that spirituality plays in the everyday life of a Libyan citizen. The next image (also found in Tripoli) takes a deeper look at the effects of the revolution. 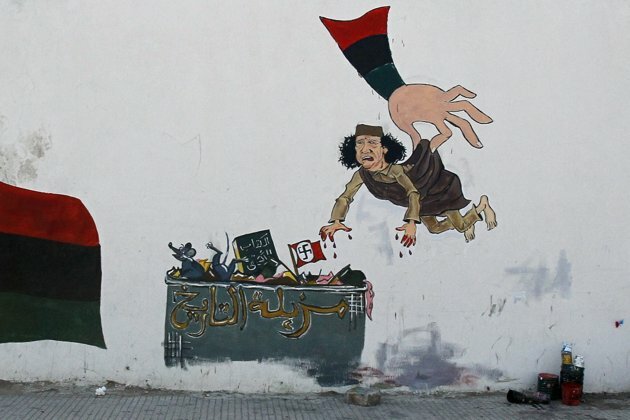 In this piece Gaddafi is being placed into a trashcan that reads "Garbage of History" across the front. Unlike the first painting, this artist appears to be looking to the future and how this uprising will be seen. The arm holding Gaddafi is painted in the same colors as the Libyan flag, representing the arm of the people throwing him away. Gaddafi also appears frightened in this painting with blood dripping from his hands unlike the first where he appears to be emotionless. Both of these paintings look at the revolution differently and represent different views that should continue to develop artistically in this newly liberated country. 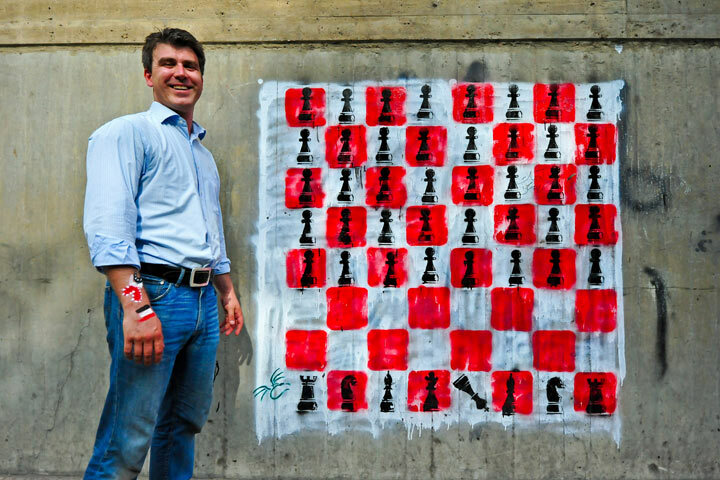 In Egypt, the street art has taken a different tone to that of battle torn Libya. Egyptian graffiti artists--more than protesting a tyrant--have taken to paying respect to those lost or leaving thought provoking reflection pieces. Egyptian artist El Teneen (meaning The Dragon) said, "Before the revolution there was no or little graffiti.What happened is not a change, it's a birth". One of El Teneen's paintings shows a chessboard in which a side full of pawns has toppled their (outnumbered) opponents made exclusively of royals. Murals are possibly the most popular pieces being created in Egypt currently. There have been many murals in honor of Khaled Mohamed Saeed, whose death was a major catalyst of the Egyptian uprisings. To see more graffiti coming from Egypt click here. 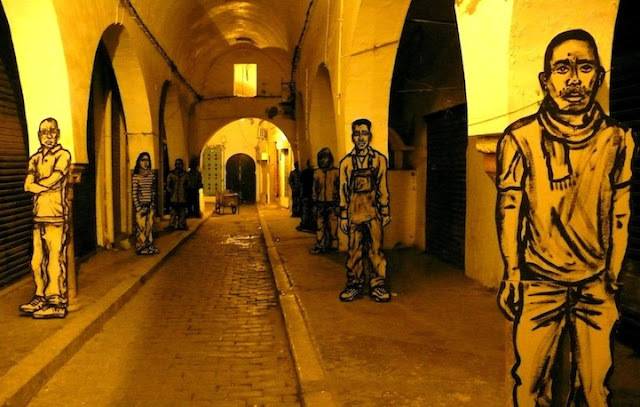 In Tunisia--where protest art still taking place today--there is a very interesting street art project that is in the most proper terms, still taking place. Algerian French art collective Zoo Project have undergone one of the most ambitious exhibitions of middle eastern street art. The group created hundreds of life-size figurines and placed them throughout the city of Tunis. Each figurine has a unique face and outfit that has been painted on and they are a reminder of those who have given their life in the revolution so far. Even though the figurines are all black and white, the expressiveness of their faces is uncanny. The amount of emotion emanating from their eyes gives them the appearance of life. While much of this art might appear crude and unsophisticated to some it is important to remember that this art is the "birth" of something new as El Teneen would say. As these countries progress through these revolutions, the art will reflect that progress. In a world where it appears that everything is a recreation of the past, it is a breath of fresh air to see raw, unadulterated art. Despite what any critic might say, anyone who is given true freedom for the first time and uses that freedom to put their feelings up on a wall is an artist in the truest sense of the word.